Crickets stridulate (the “singing” we are all familiar with) by rubbing their wings together, while grasshoppers “sing” by rubbing their hind legs against their wings. Grasshoppers “hear” with little “ears” at the base of their abdomen. In crickets these are located on the front legs. Most crickets are crepuscular (which means they come out at dusk) whereas grasshoppers tend to be active during the daytime hours. 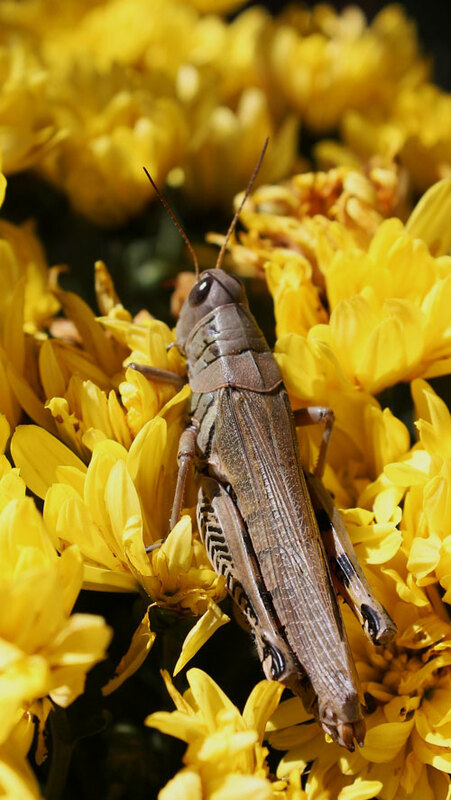 Grasshoppers mostly eat grass, but crickets have a tendency to consume animal matter in addition to plant matter. Once you’ve seen a cricket or grasshopper, you’ll always be able to recognize them – they have sturdy looking bodies and large heads, and the pronotum (the region just behind the head) is large and saddle-shaped. In both crickets and grasshoppers, the hind legs are large in proportion to their bodies. This enables them to jump relatively far considering their body size. If you see a grasshopper in the grass, just try to touch it and you will see it’s extraordinary jumping capacity. Some entomologists have suggested that the name Orthoptera should be changed to Saltatoria, from the Greek word ‘saltare’, which means ‘to leap’. Hoppers back legs are described as saltatorial. The front wings of the Orthoptera (the word comes from the Greek ‘ortho’ meaning ‘straight’ or rigid, and ‘ptera’ meaning wings) look somewhat ‘leathery’, and the hind wings are clear. This feature is also found in the cockroaches and mantids. Most Orthoptera live in the tropics, and there are around 18,000 species of them. Around 700 of these are found in Europe – mainly in the south – and only 30 species live in Britain. Their preference for warmer weather is also seen in the fact that only around half a dozen species are found as far north as Scotland. Many orthopterans are flightless, and most do not fly well, but some (i.e. locusts) are considerably able to fly in pursuit of food. One noticeable feature of this order of insects is their ability to ‘sing’ by rubbing one part of their body against another. This noise is known as stridulation. The parts that are rubbed together are called the file and the scraper. The file has little ridges, so the effect is similar to rubbing a comb along a piece of card. Grasshopper species can often be identified by their chirping song rather than by examining them. It is normally the males that stridulate, though females do it too, generally more quietly. When females are nearby the males sing a different “courtship song”, different from their usual one.